Throughout history, people have loved to shoot people that they didn't like. But then, people have also been fun of stabbing them too. Shoot or stab? What's a warrior to do? Well, fret no more, here's your answer; the 18th Century English Pistol Dagger, when you want the best of both worlds. This style of pistol dagger was very real and very deadly in history. The premise being that, because a flintlock pistol was very slow to load, a combatant could fire off a round as his or her enemy approached, then still have an effective pistol dagger when the enemy closed. A clumsy sentence, I know, but a very efficient pistol dagger. 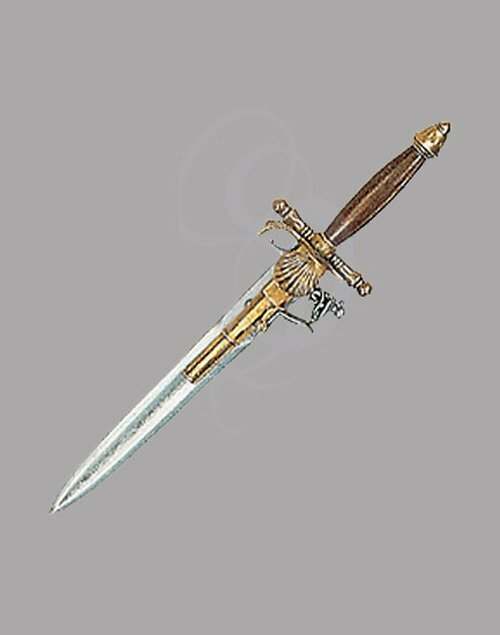 This pistol dagger is a reproduction of an actual French flintlock pistol dagger that was made in Paris in the early 18th century (1700s for those of you chronologically impaired). This replica gun features a wooden handle, simulated brass shell guard, handle, and pommel. Truly a perfect instrument for pirate or highwayman alike. Equally great as a display piece in any room.